The IndoMet Coal Project (ICP) (which was initially referred to by BHP Billiton as the Maruwai coal project), covers five potential coal deposits in East and Central Kalimantan in Indonesia. The coal deposits were discovered by BHP Billiton in the late 1990's but initial development of the first of the five deposits within the broad project area - the Haju coal project -- did not commence until 2008, was shelved in 2009 and recommenced in 2013 with first production slated for 2014. Other than the Haju mine, the other undeveloped metallurgical and thermal coal deposits are the Lampunut coal project, the Luon coal project, the Bumbun coal project and the Juloi Northwest coal project -- are located within seven Coal Contracts of Work (CCoWs). While BHP Billiton's plan is to develop the Lampunut project after Haju, the main focus of exploration work is on the Bumbun and Julio NorthWest deposits, both of which are proposed as open cut mines. In its 2013 Annual Report BHP Billiton revealed significant upgrade in the total resources of both Bumbun and Julio NorthWest deposits to 187 million tonnes and 810 million tonnes respectively. While significantly larger than both Haju and Lampunut, the Bumbun and Julio NorthWest deposits have been less intensively explored and the delineation of the coal resource is at a far earlier stage. As of early 2014, the combined coal resource of all the deposits is 1.271 billion tonnes, overwhelmingly of metallurgical coal. BHP Billiton Minerals Exploration discovered the Maruwai coal deposit in Central and East Kalimantan "in the late 1990s". The Murawai coal project has only been occasionally mentioned in subsequent BHP Billiton reports and then usually with little detail. 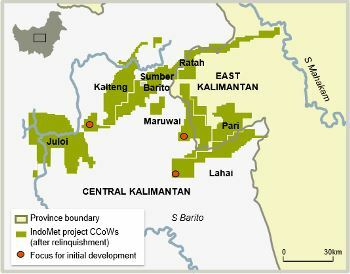 In a 2005 presentation for analysts, BHP Billiton reported that it had spent US$40 million on exploration of the project "to date" and that its concept was to develop the "Lampunut deposit and its associated Logistics Corridor" and that the Lampunut mine "will form a hub, the coal from the other 6 CCoWs will be transported using the Lampunut Logistics Corridor." The presentation optimistically stated that the project would be a 5 million tonnes a year commencing in 2008. In the presentation the company stated that "it is planned to develop 131 km transport corridor from Lampunut to the Mahakam River", "a coal barge port will be built on the Mahakam and coal transported down river 430 km to the Samarinda Delta" and then "an offshore storage vessel of 95,000 t capacity will unload coal from the barges and load the export ships." The company planned to commence mining operations with open cut mines and then "commence small scale trial underground operations in the mid term" but "the long term future is for large underground operations as open cut reserves are depleted." In June 2008 BHP Billiton announced that it decided to proceed with the US$100 million development of 1 million tonnes per annum (mtpa) Haju mine and associated river port as the first stage in the broader Murawai coal project. It was estimated that with an immediate start on construction, BHP Billiton stated that first production was "expected in mid-calendar year 2009." At the time the project was 100% owned by BHP Billiton. The company stated that the Haju mine has "expansion potential to approximately 2 mtpa. The map included in a BHP Billiton -- see right - illustrated the proposed road route for the first and second stages of the project. When announcing the go-ahead for the Haju mine, BHP Billiton also stated that "a feasibility study is currently underway for development of a 3-5 mtpa coal mine at the larger Lampunut deposit at Maruwai." "we continue to aggressively drill in the area, so, and we are still finding, literally, daily, more out, more about that particular area in that basin. What we do know, there’s a lot of coal in the seven CCWs, or contracted works that we control. We already know that we have a full range of coke and coal qualities, as well as thermal coal. We believe that the qualities that we’ve found will be sought after by our customers in the Asia-Pacific region and I think the Haju trial mine will help confirm that." "Importantly, we are working with NGOs in the regions on our key operating strategies. We clearly want to ensure that these strategies – our biodiversity strategy, our sustainable development strategy and indeed our mining strategy – are appropriate to the region and in every way world-class." No other details were provided on what NGO's the company was working with or what their "sustainable development strategy" was. In July 2009, following the global financial crisis, BHP Billiton announced that it was shelving the project after reviewing work on the trial Haju mine. In a brief media release the company stated that it had "assessed the progress of the Haju trial mine and determined it is not a sufficient fit with our long term investment strategy." It also stated that "further evaluation of the company’s interests in the Maruwai Coal Project is underway to determine the best future commercial options." In its half-yearly report annual report to the end of 2009, which was released in February 2010, BHP Billiton stated that a "total charge of US$665 million (US$23 million tax expense) was recognised primarily in relation to the decisions to cease development of the Maruwai Haju trial mine (Indonesia), sell the Suriname operations, suspend copper sulphide mining operations at Pinto Valley (US) and cease the pre-feasibility study at Corridor Sands (Mozambique)." No detailed breakdown of the write-down for each of the projects was provided. In March 2010 BHP Billiton announced that it had entered into "binding agreements to create a new joint venture for its Indonesian Coal Project (ICP) with a subsidiary of PT Adaro Energy TBK (Adaro), which has agreed to acquire a 25 per cent interest in the ICP joint venture. The finalisation of the joint venture was subject to the agreement of the Indonesian government. BHP Billiton holds the remaining 75 per cent." BHP Billiton President Metallurgical Coal, Hubie van Dalsen, stated in the company's media release that "as we progress development, we will continue our strong commitment to the protection of the region’s outstanding biodiversity.” The company did not mention the sale price of the one-quarter stake. In late May 2010 BHP Billiton and Adaro announced that the joint venture agreement had been approved by the Indonesian government. Adaro announced that its 25% stake had cost US$335 million. This inferred that the value of the whole project was US$1.34 billion. At the time of the agreement, the joint venture was Adaro Energy's only metallurgical coal project. At the time of the joint venture deal, the total resource of the IndoMet coal project was, based on a December 2009 statement of reserves, estimated at 774 million tonnes. However, of this only 83 million tonnes was classed as a "measured resource" - the most accurate assessment of the exploitable resource. Of this, 11 million tonnes of metallurgical and thermal coal was in the Haju deposit with only a further three million tonnes potential though with a lesser degree of confidence. (BHP Billiton provide no details on the breakdown between metallurgical coal and thermal coal). The Lampunent deposit was classed as having a measured resource of 72 million tonnes of metallurgical coal with a maximum potential resource totalling 110 million tonnes and possibly 10 million tonnes of thermal coal. According to Adaro Energy on June 11, 2010, just two weeks after the Indonesian government approved the joint venture deal, "Boy Thohir was appointed a Commissioner and Chia Ah Hoo and M. Syah Indra Aman were appointed Directors to the existing Boards of each of the 7 concession companies that comprise the IndoMet Coal Project." Even though work on the ground for the project had stalled, the company sought to use the potential of the project as a PR weapon against the Australian government which was proposing a 40% resources super-tax profit. In May 2010 BHP Billiton's chief executive, Marius Kloppers, publicly stated that if the tax went ahead it would make the IndoMet project more attractive compared to projects in the Bowen Basin in Queensland. "Although the resource may appear to be a limitation, we understand the planning of BHP and Adaro is for a 15 to 20 million tonnes a year operation ... If BHP is constrained in its ability to grow in Australia through infrastructure constraints or the tax grab by the government, a more meaningful development of Murawai could be on the cards." "Given that an operation of this scale would require significant investment in infrastructure (rail instead of road haulage), there would need to be further exploration success to increase the resource to justify it," he said. By September 2011 -- with metallurgical coal prices still relatively high -- BHP Billiton began to hype the project once again. In a briefing for analysts the company listed the project as one of its major options for expanding metallurgical coal production. The company boldly proclaimed that the "basin has potential to support large scale metallurgical and thermal coal production." Company executives flagged that the initial development would be in the Lahai Contract of Work area (the site of the Haju coal project), which would commence production at approximately 500,000 tonnes a year of raw coal and would "provide initial operating platform and development of transport infrastructure." This, it stated, would facilitate the "larger development at Maruwai and Juloi" contract of work areas. The company executives stated that infrastructure options included barging the coal down the Barito River or the establishment of a railway. A map included in the September 2011 presentation - see right -- illustrated the dispersed nature of the deposits. By November 2011 the Wall Street Journal reported that BHP Billiton "plans to begin work on the $US1.34 billion ($1.3bn) IndoMet coal project in Indonesia within weeks, opening up a new mining province to help meet Asian demand." The story stated that the Haju mine was the first stage of the IndoMet project "which could be producing five million metric tonnes of coking coal annually by 2017." (The $1.34 billion figure refers to the inferred value of the depoit at the time, not the cost of developing it). It also reported that the project would produce 500,000 tonnes in 2016 and five million tonnes in 2017 with potential for further expansion to 10 million tonnes a year. "PT Lahai will construct a road and a mine (Haju) and related infrastructure, commencing, subject to approvals, in the fourth quarter of 2011," a BHP spokeswoman wrote in an email to WSJ reporters. The spokesperson stated in the email that this would be followed by investments in mines and infrastructure by PT Maruwai and PT Juloi, two other joint venture companies. The Wall Street Journal story appears to have been prompted by a November 2 conference presentation by BHP Billiton CEO, Andrew Mackenzie, Group Executive and Chief Executive Non-Ferrous. The presentation stated that "our IndoMet Coal project provides us with another high quality option." At the time, the IndoMet coal project was the company's fifth largest metallurgical coal deposit. In its 2012 annual report the company stated that "study work is underway to identify development options across our CCoWs and early work on infrastructure development has commenced." However, the company did not mention the project in its September 2012 exploration and development report or its December 2012 quarter exploration and development report. In early 2013 Thiess, a subsidiary of the Australian construction company Leighton Holdings, stated that "Thiess Indonesia has just signed a new contract worth of US$51 million with PT Lahai Coal (IndoMet Coal) in Feb 2013, to establish the Haju Mine camp and Infrastructure and to construct the Muara Tuhup Port Facility in Central Kalimantan ... This is a 10-month contract, where the kick off project will be in 20 February 2013. The schedule completion of the project is end of January 2014." In its report on its first quarter 2013 activities Adaro Energy stated that "the IndoMet Coal Project is on track to begin mining from the Haju mine in the third quarter of 2013. The Haju mine is within the concession area held by PT Lahai Coal in Central Kalimantan. Construction of minesite accommodations, port site accommodations, administrative offices and an industrial area, is underway." In mid-2013 BHP Billiton stated that the Haju mine project would cost the company $80 million and would produce one million tonnes of coal a year from early 2014. BHP Billiton did not respond to a question on whether an environmental impact assessment of the project had been undertaken or whether a copy in English was available. While Thiess was boasting that work on the project was underway, BHP Billiton were still reporting nothing to shareholders. In its quarterly exploration and production reports in March 2013, June 2013, September 2013, its December 2013 half-yearly report, and March 2014 operational review , no mention was made of the IndoMet project. In its 2013 annual report, BHP Billiton simply stated of the IndoMet project that "early work on infrastructure development for the project is underway" and that "IndoMet remains a valuable future option for our coal business." "What we have done is progress a small project at Haju that is not yet operational and will not produce any coal this calendar year. This included the development of road works, loading facilities, employee accommodation and other preparatory works for a small mine. It is important to clarify that we do not apply different standards in different countries and that as with any project, we will only proceed with any development in a way that is consistent with Our Charter and any material developments or changes will be disclosed in accordance with market practices." The company was also asked what its relationship was to a proposed coal railway project in central Kalimantan. The company stated "we are not progressing the investigation or development of rail facilities in central Kalimantan." "Based on the potential of IndoMet alone, the Upper Barito Basin may be the largest coal deposit worldwide yet to be utilised, and the last frontier of global coal production ... We are extremely conscious of how these mines will affect our communities that have depended on forest and rivers systems like the Barito Basin for their livelihoods for generations." "The heavily forested Upper Barito Basin is home to large populations of orangutans and potentially many other species yet unknown to science. These forests form a significant part of Borneo's mega-diverse and world-renowned forest ecosystems. Their value has been recognised and there is an internationally supported conservation agreement, the 'Heart of Borneo' initiative that aims protect them for their biodiversity and carbon sequestration potential. Yet, the IndoMet concessions are located within the Heart of Borneo area. "If BHP continues with its plans for open cut mines it will be a disaster for my people and it will be a disaster for these fragile ecosystems. The Barito watershed is a home and source of life for thousands of traditional landowners. We simply can't afford to allow our rivers to be polluted and our forests cleared and see the profits go overseas. If the IndoMet project and others like it continue it will threaten our peoples' way of life." In January 2014 a journalist asked the company what it was doing with the project but it downplayed its significance. BHP Billiton stated that "the focus for the project, at this stage, is developing the infrastructure, particularly the construction of roads and port loading facilities, and we continue to evaluate the potential for larger-scale developments in the region." 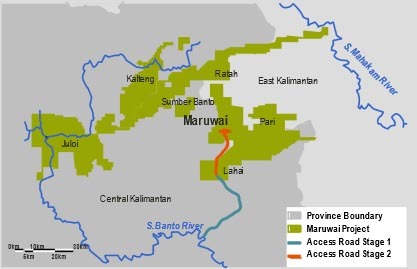 Late 1990's: BHP Billiton Minerals Exploration discovers Maruwai coal deposit in Central and East Kalimantan. June 2008: BHP Billiton announces approval for US$100 million development of 1 million tonnes per annum Haju mine as first stage in the broader Murawai coal project. June 2009: BHP Billiton announced that it had shelved the development of the Haju mine as "it is not a sufficient fit with our long term investment strategy." March 2010: BHP Billiton announced that it had sold a 25% stake in the IndoMet Coal Project to Adaro Energy. September 2011: BHP Billiton starts talking the project up again. November 2011: BHP Billiton flags that the project will begin within weeks. September 2012: BHP Billiton states in its 2012 annual report that "study work is underway to identify development options across our CCoWs and early work on infrastructure development has commenced." February 2013: Thiess, a subsidiary of the Australian construction company, stated that it had won a contract to "establish the Haju Mine camp and Infrastructure and to construct the Muara Tuhup Port Facility in Central Kalimantan." October 2013: At it BHP Billiton was asked why it was pursuing the IndoMet project. The company stated that "we do not apply different standards in different countries and that as with any project, we will only proceed with any development in a way that is consistent with Our Charter and any material developments or changes will be disclosed in accordance with market practices." ↑ 1.0 1.1 BHP Billiton, "BHP Billiton Annual Report 2013", September 2013, page 77. ↑ 2.0 2.1 2.2 2.3 2.4 2.5 BHP Billiton, "BHP Billiton Approves Stage One Development of Murawai Coal Development", Media Release, June 8, 2014. ↑ Dave Murray, President BHP Billiton Metallurgical Coal, "Analysts and Investors Site Visit", Queensland, June 2, 2005, pages 64-66. ↑ Dave Murray, President BHP Billiton Metallurgical Coal, "Analysts and Investors Site Visit", Queensland, June 2, 2005, page 67. ↑ Dave Murray, President BHP Billiton Metallurgical Coal, "Analysts and Investors Site Visit", Queensland, June 2, 2005, page 68. ↑ 6.0 6.1 Dave Murray, President Coal, BHP Billiton "BHP Billiton plc – Investor Relations: Steelmaking Materials Briefing: Transcript", BHP Billiton, 24 June 2008, page 25. ↑ 7.0 7.1 BHP Billiton, "Review of Maruwai Coal Project in Indonesia", Media Release, June 9, 2009. ↑ BHP Billiton, "BHP Billiton results for the half-year ended 31 December 2009", page 30. ↑ 9.0 9.1 9.2 BHP Billiton, "BHP Billiton Enters Into a Joint Venture For Its Indonesian Coal Project (Maruwai)", Media Release, March 31, 2010. ↑ BHP Billiton, "BHP Billiton Finalises Joint Venture Arrangements for its Indonesian Coal Project", Media Release, May 27, 2010. ↑ Adaro Energy, "Adaro Energy and BHP Billiton Finalize Joint Venture Arrangements for the Indonesian Coal Project (Muruwai)", Media Release, May 27, 2010. ↑ 12.0 12.1 BHP Billiton, "BHP Billiton Indonesian Coal Project - Coal Resource Statement as at 31st December 2009", March 31, 2010. ↑ Adaro Energy, "Adaro Energy: On Track to Build a Bigger and Better Adaro Energy", Presentation to Citi Indonesia Investor Conference, August 2010, page 4. ↑ Matt Chambers, "Offshore coal deal appeals to BHP in face of RSPT", The Australian, May 29, 2010. ↑ Matt Chambers, "BHP Billiton eyes Indonesian coal upgrade", The Australian, June 4, 2010. ↑ 16.0 16.1 16.2 16.3 Hubie van Dalsen, President Metallurgical Coal and Phil Hynes, Vice President Project Development Metallurgical Coal, "Metallurgical coal briefing", BHP Billiton website, September 30, 2011. (See pages 26, 27, 30 and 39). See also Phil Hynes, Vice President Project Development Metallurgical Coal, "Metallurgical coal briefing", BHP Billiton website, September 30, 2011, pages 50, 52, 53. ↑ 17.0 17.1 David Fickling and David Winning, "BHP Billiton to Begin Work on Indonesia Coal Project", Wall Street Journal, November 3, 2011. (This story was republished in The Australian as well. ↑ Andrew Mackenzie, Group Executive and Chief Executive Non-Ferrous, [http://www.bhpbilliton.com/home/investors/reports/Documents/2011/111102%20Deutsche%20Bank%20BRICS%20MetalsMining%20Conference.pdf "Deutsche Bank BRICS Metals & Mining Conference", Presentation to the Deutsche Bank BRICS Metals & Mining Conference, London, November 2, 2011, page 12. ↑ 19.0 19.1 BHP Billiton, 2012 BHP Billiton Annual Report, BHP Billiton, September 2012, page 37. ↑ BHP Billiton, "BHP Billiton Exploration and Development Report for the quarter ended 30 September 20", Media Release, October 17 2012. ↑ BHP Billiton, "BHP Billiton Exploration and Development Report for the quarter ended 31 December 2012", Media Release, January 23, 2013. ↑ 22.0 22.1 "Lahai Coal (indomet) Mine Infrastructure & Port Handling,Central Kalimantan,Indonesia", Thiess website, accessed May 2014. ↑ Adaro Energy, "Quarterly Activities Report First Quarter of 2013 For the Three Months Ending March 31st, 2013", Adaro Energy, page 13. ↑ Bob Burton, "What Is BHP Up To In Indonesia? ", New Matilda, July 2, 2013. ↑ BHP Billiton, "BHP Billiton Exploration and Development Report for the Quarter Ended 31 March 2013", Media Release, April 17, 2013. ↑ BHP Billiton, "BHP Billiton Exploration and Development Report for the Year Ended 30 June 2013", Media Release, July 17, 2013. ↑ BHP Billiton, "BHP Billiton Operational Review for the Half Year Ended 31 December 2013", Media Release, January 22, 2014. ↑ "BHP Billiton Operational Review for the Nine Months Ended 31 March 2014", Media Release, April 16, 2014. ↑ BHP Billiton, "BHP Billiton Annual Report 2013", BHP Billiton, September 2013, page 39. ↑ 31.0 31.1 31.2 BHP Billiton, "Annual General Meeting 2013", October 24, 2013, page 6. ↑ Peter Ker, "Miners confused by Indonesian export ban", Sydney Morning Herald, January 16, 2014. BHP Billiton, "BHP Billiton Approves Stage One Development of Murawai Coal Development", Media Release, June 8, 2008. BHP Billiton, "Fatality at IndoMet Coal Project, Indonesia", Media Release, January 23, 2013. Matt Chambers, "Offshore coal deal appeals to BHP in face of RSPT", The Australian, May 29, 2010. Matt Chambers, "BHP Billiton eyes Indonesian coal upgrade", The Australian, June 4, 2010. Raras Cahyafitri, "IndoMet Coal expected to start production in Q3", Jakarta Post, May 8 2013. Bob Burton, "What Is BHP Up To In Indonesia? ", New Matilda, July 2, 2013. London Mining Network, "BHP Billiton to be slammed for Borneo coal mining", Oneworld, Media Release, October 22, 2013. Arie Rompas, "BHP in Indonesian Borneo: the coal disaster waiting to happen", ABC Environment, November 19, 2013. Oliver Milman, "Fears for orangutans: BHP urged to abandon coalmining in central Borneo: Friends of the Earth say expansion of Indomet project will cause deforestation and damage rivers of the upper Barito basin", The Guardian, November 7, 2013. This page was last edited on 27 September 2017, at 23:50.